This is a calming treatment cream that addresses the most common symptoms of psoriasis by enhancing its ability to retain moisture. 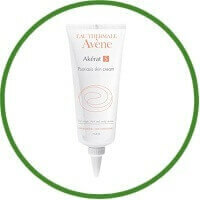 This creamy, gentle treatment cream prevents itching, redness, irritation; flaking and scaly skin of the body and scalp. Skin is soothed with Avene’s Thermal Spring Water while infused with nourishing and moisturizing ingredients for complete suppleness restoration of thick skin. Hypoallergenic, non-comedogenic and is packaged in a custom tube for precise application. 1. Avene Thermal Spring Water nourishes skin. 2. 2% Salicylic Acid gently exfoliates and unclogs pores. 3. Sweet Almond Oil and Mineral Oil nourish and condition skin. 4. It works on skin with psoriasis, thick, scaly skin. 5. It is safe enough for sensitive skin.